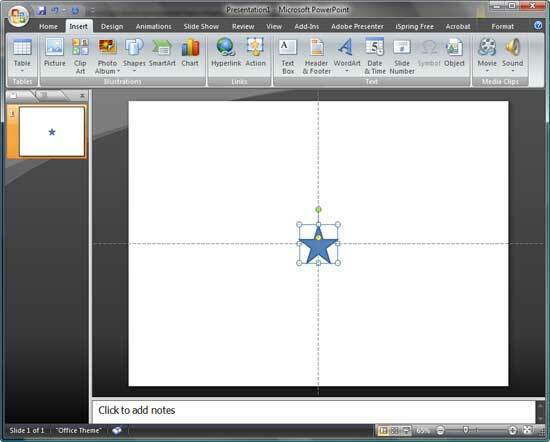 Learn how to insert Shapes in PowerPoint 2007. I always believe that Shapes are the building block using which you can add	any type	of graphic to your PowerPoint slide -- most content that you can select on the slide such as ungrouped tables or charts, Shapes, or even a video clip works so much like a Shape. Learn to format shapes, and you can use the same tricks to format these other slide objects. As part of this Learn PowerPoint series, I already have covered many such topics and more are continuously being added -- today's tutorial shows how you can quickly add a shape to your PowerPoint slide. 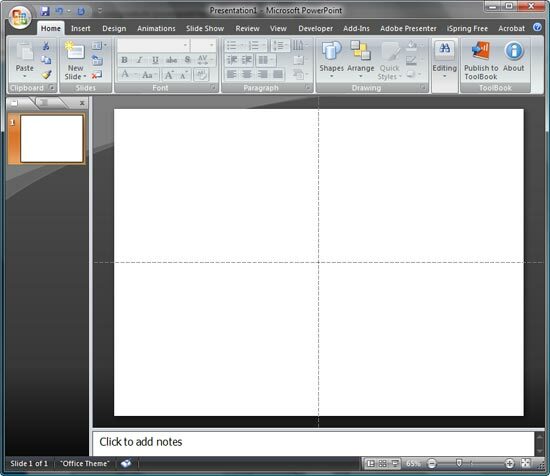 Within PowerPoint 2007, open any presentation (or create a new one), and select the slide where you want to insert the Shape. It will be good if you change the slide layout to Blank or Title only (see Figure 1). 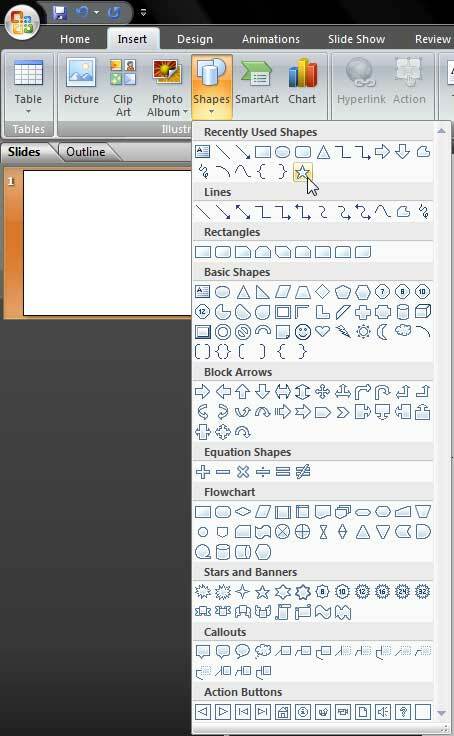 Access the Insert tab (or even the Home tab) of the Ribbon and click the bottom part of the Shapes button to bring up the dropdown Shapes gallery, as shown in the Figure 2. As shown in Figure 2 above, PowerPoint provides categories for shapes such as Rectangles, Lines, Basic Shapes, Block Arrows, Stars and Banners, Callouts, etc. Click anywhere on the slide to add the Shape in a predefined size (typically 1 inch x 1 inch), as shown in Figure 3. Click and drag on the slide to create an instance of the Shape in the size you desire. Tip: Hold the Shift key while dragging to constrain the height and width proportions. Hold the Ctrl key to draw a Shape from the center. You can also draw while holding both the Ctrl and Shift keys.